In The Sixth Extinction, Elizabeth Kolbert studies the relationship between human beings and the environment, and concludes that human behavior is on the verge of causing (or may have already caused) a mass-extinction—the sixth in the history of the planet. All over the world, different species are already going extinct, thanks to the declining amount of available undeveloped land, and the rising temperature. In Panama, for example, the population of golden frogs—once impossible to avoid—has dwindled to a few dozen. Kolbert’s visit to Panama to study the golden frog inspired her to learn more about extinction and its place in the history of science. Kolbert learned that, for most of the history of science, humans didn’t understand that some animals went extinct. It was Georges Cuvier, the influential naturalist, who first proposed that some species that lived thousands of years ago are no longer alive. Cuvier and his contemporaries discovered prehistoric fossils of large mammals, such as the mastodon and the giant sloth, further legitimating the theory of extinction. However, Cuvier believed that extinction is a slow, gradual, and somewhat random process. Even after Charles Darwin published his influential book, On the Origin of Species, scientists didn’t grasp that human beings are capable of influencing the environment to the point where certain species die out. It wasn’t until the late 19th century that the scientist Alfred Newton, in an effort to preserve the surviving population of great auks (a bird) in Iceland, pioneered the idea that humans could play a role in preserving species at risk of going extinct. It took much longer for scientists to realize that humans were responsible for the extinction of hundreds of animals. A major milestone in scientists’ understanding of extinction was the paper penned by Walter Alvarez and Luis Alvarez in the 1980s, arguing that the dinosaurs went extinct because of a large asteroid that hit the Earth. While the Alvarezes’ theory was dismissed at first, it gradually became an accepted theory. This reinforced the theory of mass-extinction—that is, the notion that many species go extinct at almost the same time, rather than dying out gradually over time. One reason that species go extinct is that once-useful evolutionary qualities usually don’t remain useful over time. For example, the ammonite—a prehistoric, nautilus-like creature—was once extremely common because currents swept its small, delicate eggs across the globe. But after an asteroid struck the Earth, the ammonite’s eggs were too weak to survive the catastrophe—in short, a useful evolutionary trait became a major liability. The Earth is constantly experiencing sudden changes in temperature, pressure, and climate, which means that species are always facing challenges to their survival. Kolbert argues that we are living in the Anthropocene period of planetary history—an epoch defined by human beings’ attempts to manipulate their environments, resulting in the extinction or near-extinction of many different species. Examining the fossil record, one notices many points in planetary history when there may have been a mass-extinction. However, the Sixth Extinction, in which we’re all living, will be unique in the Earth’s history because it will have been caused by human beings. By burning fossil fuels and cutting down forests, human beings have drastically increased the temperature and acidity of ocean water, meaning that sea creatures will have to adapt to the changing environment, or die out. The increased acidity of the oceans has been devastating to calcifiers—sea creatures such as clams, barnacles, and starfish—that rely on calcium for their shells and exoskeletons. Kolbert travels to the Great Barrier Reef, where scientists show her the impact that increased temperature and acidity have had on the diversity of life in coral reefs. Warmer temperatures will increase the amount of algae and plankton in the ecosystem, which will in turn decrease the amount of available nutrition for larger animals. She also visits the tropical rainforests of South America, where she sees the phenomenal diversity of life there. In the last few decades, scientists have found evidence that different rainforest species are being forced to migrate, in the hopes of finding an environment comparable to the one to which they’re most accustomed. At the same time, the total amount of available land for wild creatures is constantly decreasing, thanks to the deforestation of the rainforests by farmers and ranchers. Some rainforest species will survive the environmental changes facing the planet, but others will not. Furthermore, the extinction of even a few rainforest species will have a massive impact on the overall biodiversity of the rainforest, since rainforest species are connected to one another very closely. Another important factor in the Sixth Extinction is human travel. Since prehistoric times, different species have been confined to different ecosystems; each ecosystem has developed a complex equilibrium, predicated on its isolation from the rest of the world. Due to modern human travel and transportation, however, different species have traveled around the world, upsetting the equilibrium of the new ecosystems they enter (for example, the introduction of toads to Australia in the 1930s caused the extinction of dozens of different plant and insect species). Species introduced to a new environment—or “invasive species”—tend to reduce biodiversity in the long run. In an effort to stave off the Sixth Extinction, some scientists have been trying to get endangered animals, such as the rhinoceros, to reproduce more quickly. Yet the only reason that rhinos and other large animals are on the verge of extinction is that humans overhunted them. Indeed, humans have been hunting large mammals for tens of thousands of years. Despite some controversy in the scientific community, it’s highly likely that prehistoric creatures such as the mastodon and the giant sloth went extinct because early human beings wiped them out, suggesting that, in a sense, the Sixth Extinction began thousands of years ago, long before the Industrial Revolution. Kolbert travels to Germany, where she learns about the Neanderthal—an early, humanoid creature that went extinct thousands of years ago. While the popular, cartoonish model of the Neanderthal is a hairy, ape-like creature, it’s likely that Neanderthals were technologically advanced for their time, stood up straight, buried their dead, and had larger brains than modern Homo sapiens. Based on their genetic research, scientists believe that early human beings, migrating from Africa, interbred with the Neanderthals, meaning that some modern human beings have Neanderthal DNA. Perhaps the fact that humans have survived extinction and Neanderthals have not is indicative of a uniquely human quality—“mad ambition.” For as long as they’ve existed, humans have explored the world with intense curiosity. Perhaps the Neanderthals were a more peaceful, docile species, and human beings either outcompeted them or actively wiped them out. Kolbert acknowledges that her book paints a bleak picture of the human race. However, it’s important to keep in mind that humans, for all their power to change the environment, also have the power to preserve, nurture, and protect. Humans need to continue working to preserve endangered species, and to recognize that, no matter what they do in the future, their actions have already ushered in a Sixth Extinction that will shape the world for millennia. Arn, Jackson. "The Sixth Extinction Plot Summary." LitCharts. LitCharts LLC, 22 Jun 2017. Web. 22 Apr 2019. Arn, Jackson. "The Sixth Extinction Plot Summary." LitCharts LLC, June 22, 2017. 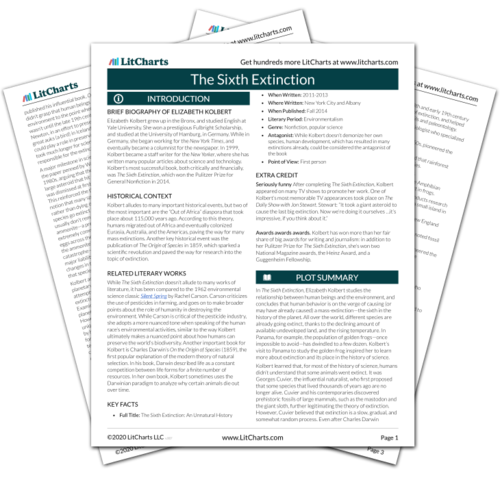 Retrieved April 22, 2019. https://www.litcharts.com/lit/the-sixth-extinction/summary.